Just one “cell” block from downtown and everything Yellow Springs. This historic jailhouse building was built in 1878 and in use as the town jail until 1929. The Union Cottage is just around the corner. We are located on the Little Miami scenic bike trail and we are looking forward to welcoming guest and friends to enjoy our three newly renevated suites. 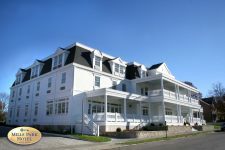 We are within walking distance to a laundry mat, the post office, and a general store. Xenia is 6 miles, Bellbrook is 6 miles, and Waynesville is 7 miles away. Whether you are here on business or pleasure, we welcome you to the La Quinta Inn & Suites Fairborn Wright-Patterson hotel, less than a mile from Wright State University and within 3 miles of Mall at Fairfield Commons and Dayton Aviation Heritage National Historical Park. Our amenities strive to make your stay convenient and stress-free. Relax in our indoor swimming pool. Keep up your exercise routine at our fitness center and take care of business at our business center. Stay connected from the comfort of your room with free high-speed internet access. Our guest rooms in our 100% non-smoking hotel is equipped with microwaves, refrigerators, 40″ flat screen TVs, pillowtop mattresses, coffee makers, hair dryers, iron and boards, and free local calls. Start your day off right with our free Bright Side Breakfast that includes an assortment of hot breakfast items, tea and hot chocolate, assorted juices, bagels, breads, hot and cold cereals, fresh fruit, and yogurt. Breakfast: Deluxe continential Hot and cold. Alcohol Comments: Hotel does not carry liquer licence. 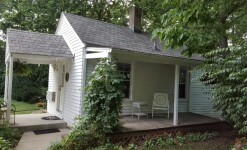 The original house, a prairie style one and a half story house built at the site of the first grist mill to operate in Fairborn, Ohio. Long after the house was first built in 1920 the owners added a full second story, a small cottage and a carriage house on the property that was often referred to as the “Mill Pond Acre”. This is a beautiful acre of land located within the city limits and walking distance to all the shops and cafes of Fairborn. A modern perspective on historic lodging in the heart of downtown Yellow Springs, the Mills Park Hotel offers gracious hospitality and luxurious accommodations that blend the comforts of home with upscale state-of-the-art amenities. Our stately suites and spacious rooms provide a relaxing haven with an exceptional attention to detail. Plantation shutters. Oak floors. Hand-laid tile. At the Mills Park Hotel, we pride ourselves on pairing classic design with modern influences.